Old documents are one of the things I find most interesting about genealogy research. They can be difficult to decipher because of physical damage, unfamiliar hand-writing styles, and of course, language. Even if the handwriting is crystal clear, a document written before 1600 means you have to deal with varieties of languages that are not much like the modern day equivalents. There are dozens and dozens of different ways that (for example) a birth might be recorded depending on date and place. City and hospital records, state and federal official documents with or without certification, church registers, parish registers, records kept by religious administrations. I will add example documents here as time permits. This is one of the most interesting documents I’ve come across. 1 Sep 1649. Power of attorney from Anthony Bermoeda to Hans Weber. Source: New York State Archives. New York (Colony). Secretary of the Province. Register of the Provincial Secretary, 1642-1660. Series A0270-78. Volume 3, documents 64a – 64b-c, side 1. to receive his share of the prize [ship] the Tobasco. Alice Heywood Burial Record from the England & Wales, Quaker Birth, Marriage, and Death Registers, 1578-1837. Alice was 14 when she died in 1737. Her father Ephraim arranged the burial. Affidavit of Birth for Federico Lippi. 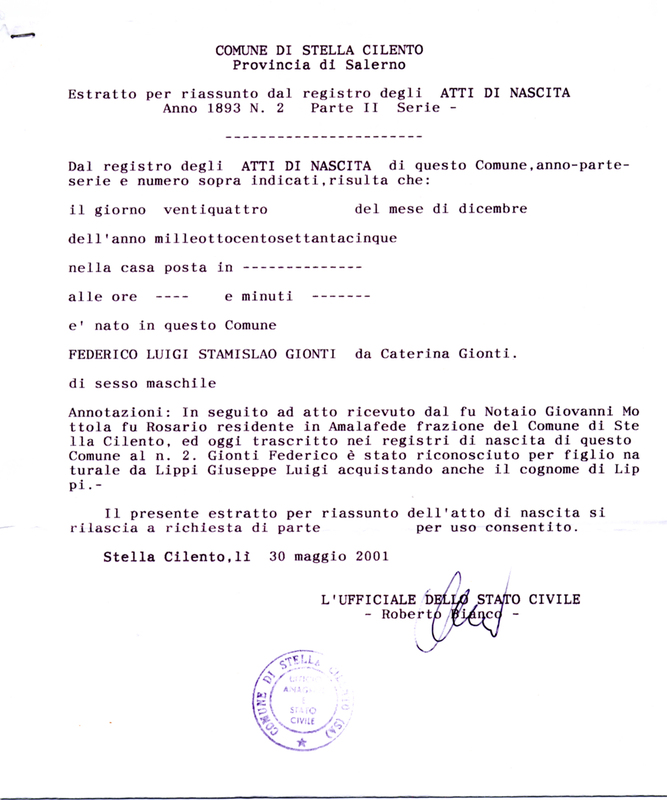 With this document his father claimed paternity of and responsibility for Federico, whose mother was not his wife. Stella Cilento, Campania, Italy. 1875. United States Census, 1790. Moses Coolbaugh was EEG’s 6x Great Grandfather. His farm was located in Wysox, Luzerne, Pennsylvania.